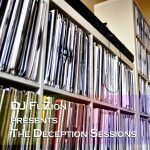 So, Drum & Bass Review Show has ended & the Deceptive Audio show came to a close in 2009 (with no plans to return to that particular format), what’s next? Not to be mistaken with the DCA Show, this new show has none of the pressures of (6 hours of) hard work each week, which the review show demanded & it removes pressures of chasing, obtaining & delivering the very latest tracks in the scene. In short, we will play whatever we feel like it at the time. Tune in every week at dnbradio.com from 11am (UK time) & join in the chatroom (no sign up needed).